Cyclone Steel Buildings utilise cold rolled steel portal frame technology in the construction of our steel buildings, produced in the UK for the UK. Through our partners Steadmans and Capital Steel Buildings we use this method as it greatly reduces the price of our steel buildings and requires significantly less steel compared to hot rolled steel buildings. This makes our steel buildings lighter and easier to transport reducing our carbon footprint and therefore yours too!! Cyclone Steel Buildings utilise the best materials available with the use of the highest quality cladding manufactured by the respected A Steadmans and Sons. We use their composite roof and wall panels where insulation is required. These consist of a core of PIR insulation sandwiched between a heavily profiled external weather sheet and an internal shallow profiled liner. The insulation bonds to the steel during the manufacturing process and together the insulation and the sheet steel form strong and rigid panels with good thermal performance which is certified by the Loss Prevention Certification Board (LPCB). The PIR insulation within the composite panels has a thermal conductivity of 0.019W/mK; that gives the panels their good thermal performance and the large panel dimensions and the edge lap seals give the composite panel systems good resistance to air leakage. Steadmans also supply a range of NFRC Class A butyl sealants, profile foam fillers and expanding foams to enable the composite panels to be sealed to each other and to other building components, so avoiding thermal bridging and air leakage. The high vapour resistance of the liner sheet and the factory applied edge seal will inhibit interstitial condensation and their panels are unlikely to be affected by surface condensation as the high performance core will keep the temperature of the liner sheet above dewpoint. 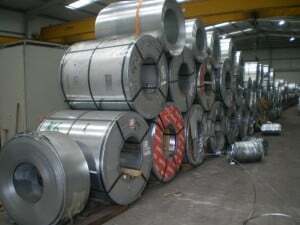 The steel outer skin is 0.5mm thick and the inner is 0.4mm thick, the steel is either hot dipped galvanised to BS EN 10142:2000 or BS EN 10147:2000 or is Aluzinc coated. These panels are supplied with a guarantee of up to 25 years and the manufacturing process itself is certified to ISO 9001:2000 which is a guarantee of quality standards due to regular audits. Composite panels have a predicted service life of 40 years. Time to first maintenance depends upon the finish and the environmental conditions but can be as high as 30 years. Coatings will degrade more rapidly in industrial or marine air conditions as oxidisation is normally accelerated in these environments and dark finishes will fade more rapidly than light ones. 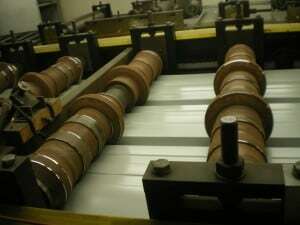 Service life can be increased by treating cut edges with site applied touch up paint at the time of cutting. Another excellent feature of the composite panel system is that they are unaffected by mould, fungi or mildew and they do not support vermin.